A new federal and state e-filing interface has been added to Advanced Accounting 7i's payroll module that can be used to electronically file W-2 forms with both the IRS as well as in various states. The trend towards paperless forms has been apparent for some time. The threshold for filing state forms in many states continues to be lowered. Some states (Connecticut, North Carolina, Oregon, Utah, and Virginia as of the date of this post) already do not accept the filing of paper W-2 forms, i.e. the threshold is zero. Minnesota has a threshold of just ten forms. Six states have a requirement of either 25 or in one case 26, and another seven currently have a requirement of either 50 or 51. These numbers will continue to drop, and states with state income tax withholding that currently have a high (or no) threshold will no doubt be implementing similar requirements in the near future. While the IRS/SSA threshold is still 250, the IRS continues to strongly encourage e-filing to improve accuracy and timeliness and we would expect that number to be significantly lowered in the not too distant future. States such as Utah have gone paperless under the philosophy that it is a safer mode of transmitting highly sensitive information. Many end users are increasingly wanting to file their SSA copies electronically for this same reason. Further, the complexity and ever-changing nature of these requirements both federally and on a state-to-state basis indicated that a better overall solution was needed for Advanced Accounting users. 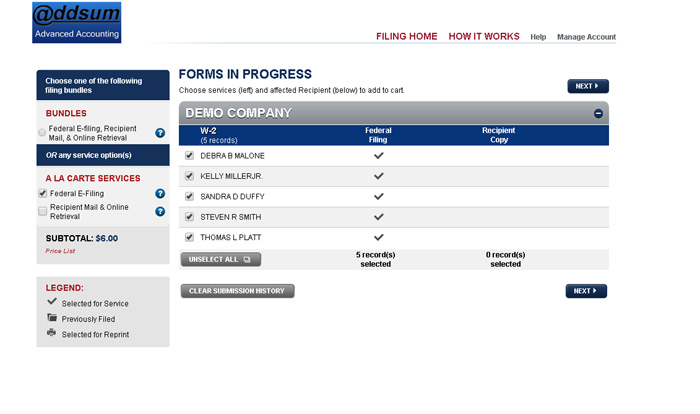 A federal filing format option has long existed in the software and one that we have regularly updated over the years. Originally it was referred to as the 'W-2 Electronic/Mag Media Filing" option. We first started making significant updates to this option going back to at least as early as July of 1997. That program was originally using the MMREF-1 format. In tax years starting in 2007, the MMREF started to be referred to as the EFW2 format, which we continued to support through the end of 2014. But the complications of that rather esoteric format coupled with increasing additions and requirements have made it difficult to make it a full solution even for federal-only e-filers. Further, states typically have their own separate requirements that the prior option could not satisfy. So, in mid-December of 2014, we entered into some preliminary agreements with Nelco Solutions. An actual interface however has not been available until now, and we are in the process of submitting test cases to validate the results (postscript: 2015 acceptance testing was completed on January 6, 2016). We therefore anticipate that the interface will be available to users for 2015 filings, and it is being included in year end payroll updates. Nelco specializes in W-2 and related e-filings and is an organization we have kept in touch with for well over a decade now in terms of potentially working together to come up with an effective solution for end users. New capabilities and options will no doubt be made available to our payroll users and their employees as we go forward as a result of this collaboration. 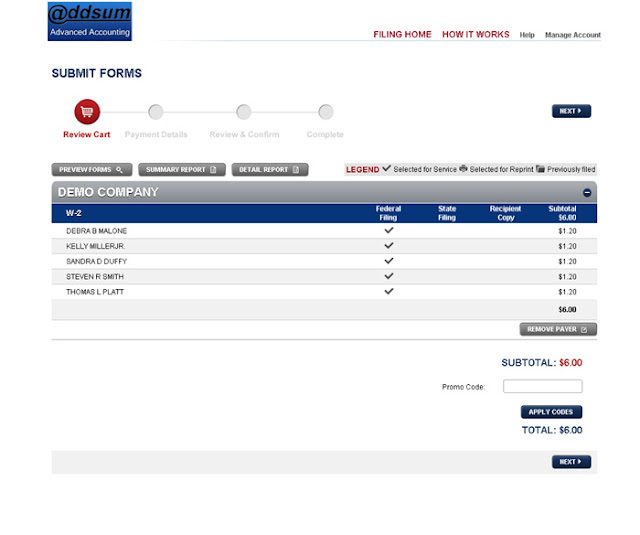 Further, this option simply supplements the existing payroll module and in no way replaces it. There are typically small fees associated with submitting these filings through the interface. We believe that users will find these fees very reasonable particularly given not only the convenience and complexity involved but also in meeting applicable federal and state requirement. Answer "Y" to the export file option. Then simply continue to process W-2's including a W-3 if desired. This includes editing informational boxes as already provided in the software. Prior to editing that information, however, when choosing the export file option, a new screen will appear asking for verification of the submitting company name, address, phone and e-mail. In addition, you will be asked for the folder and file name of the export file. The file name can have any desired extension (a CSV extension is recommended). If the directory does not exist, the program can optionally create it. If the file name selected exists, you will receive a warning message and will be asked if you want to overwrite (normally you would not select an existing file). Click on proceed to continue and then proceed to process W-2's and optionally a W-3 as normal. At the end of the normal process and after having chosen the export file option, you will then see a (new) launch portal screen from within the software. This screen will also repeat the full path of the file name which we suggest you either copy and paste and/or make a handwritten note. Before clicking anywhere on the panel in the left corner of this screen, you can if desired retrieve the CSV in a spreadsheet program for review. Normally you would not want to make any changes to the CSV file unless there is an unusual situation involving an error that needs to be corrected prior to submission. The file otherwise must remain in the exact same format and delimited the same way. The CSV file naturally contains confidential employee information which should be safeguarded and not made available to others. We suggest retaining a copy of the file however at least until the process is completed and you receive acknowledgment of your filing request. Submitting the file through the portal however is safe. 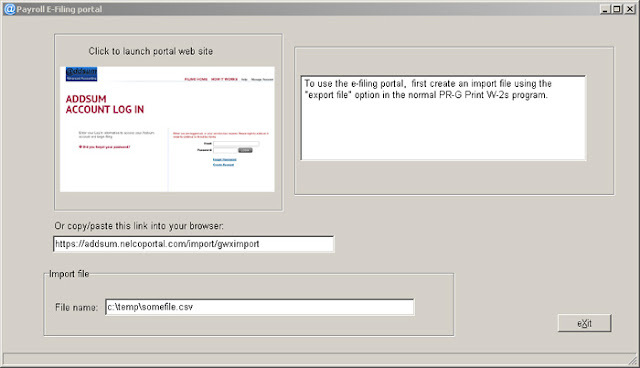 The PR-R-C option now also shows this same screen (but without the import file box) simply to provide a way to reference the portal's web site if follow-up or other action is needed, but not because the import is otherwise initiated here, as it formerly optionally was (this is is where the older EFW2 export option existed which has now been retired). After launching the portal, either create a new account when logging in for the first time or log in with your previously established credentials. Then at the data import screen, import the same file that was created above within the accounting software (click on the Choose file option, and select the import file). After clicking on import, unless problems were detected in the upload, you will select your filing options. 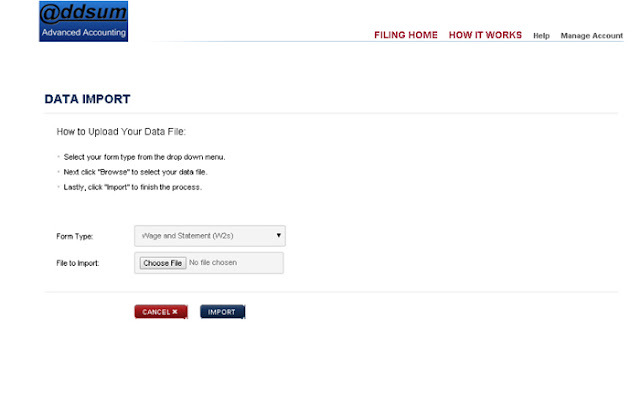 If you will only be filing federally, be sure to click on the "federal e-filing" check box. If wages are submitted for a state that has an e-filing option, a "State E-filing" check box option and an additional column next to each employee will appear. You can choose to file federal and state via the "a la carte services" section, or you can choose the "full" service (bundles) that also includes Nelco actually printing the employee copies and providing employees with e-mail address to the filings (requires the input of each employee's e-mail address; in a future Adv release we will be providing a more automated way to accomplish that). So using the full/bundled service allows users to not even have to purchase W-2 forms and saves the time involved in both printing them as well as providing them to employees. Make sure that the appropriate options are reflected on this screen. Click on Next to review and submit your forms. After clicking on Next from the submit forms, you simply enter your payment/card information and the process is complete. If a problem is detected at the web portal import stage, those errors will be outlined as which point you can return to the import page to try again after correcting the errors (contact us 1-801-277-9240 or e-mail us at support@addsuminc.com to resolve any problems in this regard). When filing in a given state, any required form that is required by that state will appear as part of the submission process with as many boxes already completed as possible based on the data imported. While to initially submit and import data any of the major browsers seem to work without problems, Nelco recommends the use Internet Explorer. When making state filings and a form has to be completed, the web portal may inform you that you need to use Internet Explorer with the free Silverlight plug-in. This does not create any additional work should this happen since any imported data will still remain pending. Switch to an IE browser with the Silverlight plug-in installed and log back into the portal and proceed to manage your account where you will be able to proceed with completing your submission. In all it is an efficient and economic solution to federal and state e-filings.